Nestled in the historic Montmartre neighborhood of Paris, the Place du Tertre is beloved by tourists. Lined with cafes, bistros and restaurants and nearly permanently occupied by artists painting in the open air, the square is an essential sight when visiting the area. But it's admittedly a bit too touristy to warrant spending hours there. After taking a look, interacting with some of the artists if desired and admiring some of the square's finer details, it's time to explore the sinewy, haunting streets that surround it. 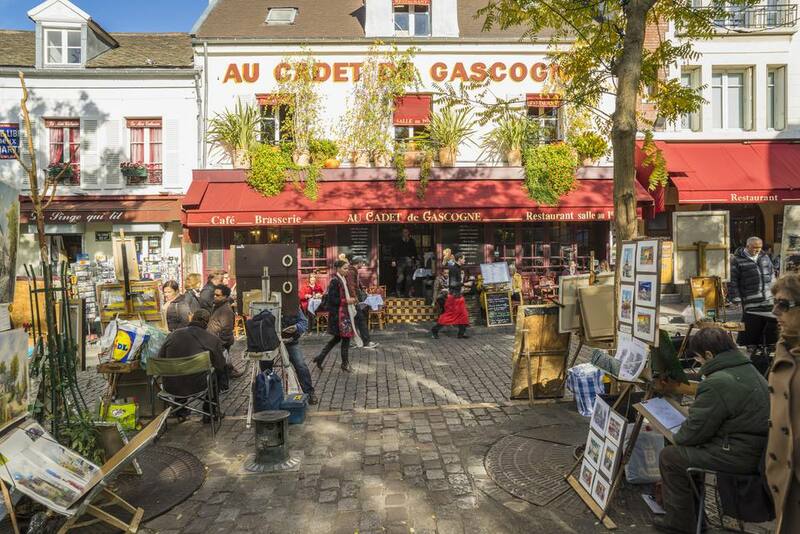 From museums to churches, vineyards, cabarets and even windmills, these are the top 10 things to see and do around the Place du Tertre. While the brasseries, cafés and restaurants clustered around the Place du Tertre are not the best places in Montmartre for a meal (see our earlier comments on the square being a bit of a tourist trap), one café in particular merits a stop. Chez la Mère Catherine is rumored to have been the place where the word "bistro" was first coined in around 1814. The legend has it that Russian soldiers who came to drink at the bar after a final Napoleonic battle in Paris cried out "Bystro! Bystro!" to servers, demanding that they hurry up and bring drinks. The word "bistro" was subsequently popularized as a way of describing casual restaurants — perhaps because service tends to be quicker than at more formal counterparts. The brasserie/café, which boasts a lovely garden, was first opened in 1793 by a woman named Catherine Lemoine. It's also supposedly the place where the French revolutionary leader Danton met with his camarades during the late 18th century. Have a drink, enjoy live performances of traditional French songs, and take in the slightly corny but still charming vibe at the historic restaurant. Just don't pester your servers with impatient cries of "Bystro!" One of the most-recognized churches in the French capital, the Sacré Coeur is a bit of a visual oddity — but it's all the more beloved for it. Often compared to a giant meringue due to its dramatic domed structures and eggshell color, the basilica was commissioned in the late 19th century following two bloody European and French wars, conceived as a symbol of peace and reconciliation (as well as a re-assertion of Catholic influence). Ironically, it was only completed in 1914 — the same year World War I broke out. Today, over a million visitors per year visit the Sacré Coeur — and millions more photograph its iconic exterior, from up-close or afar. Take a peek inside if time allows (free), and climb a dizzying spiral staircase to the top of the central dome. You'll have to buy a ticket for the latter. The Sacré Coeur and its enormous terrace both afford dramatic panoramic views over the rooftops of Paris. While the vantages are better from the basilica's meringue-like dome, you'll be charged a fee to climb up to the top and and view the panorama from an even more towering perspective. The ascent up the stairs is steep and a bit claustrophobic, and isn't appropriate for anyone with limited mobility or heart conditions. Many visitors content themselves with sticking to the panoramic terrace outside the entrance. From here, photo opportunities abound — assuming, of course, the conditions are clear enough. On a good day, you can spot quite a few iconic monuments and buildings on the horizon, including the Eiffel Tower, Notre Dame Cathedral, the Centre Georges Pompidou and the Montparnasse Tower. If you can, go in the early morning to avoid the crowds and enjoy a peaceful spectacle. Interested in the life, work and larger-than-life persona of Spanish artist Salvador Dali? A longtime Montmartre resident, Dali lived for a time at 7, rue Becquerel from 1929 with his wife, Gala. A newly refurbished private museum dedicated to his singular work is situated right in the heart of the neighborhood, only a few blocks from the commotion around the Sacré Coeur. At the Dali Museum, browse some 300 works of art from the iconic moustached figure: paintings, sculptures, furniture and various surrealist objects make up the collection. Referencing everything from Don Quixote to Alice in Wonderland and biblical tales, Dali's work is iconoclastic and frequently filled with humor. This is the only museum dedicated almost exclusively to his life and work, and the intimate collection is a joy to visit. Looming in the shadows of the Sacré Coeur is a much lesser-known but important Montmartre church, the Eglise Saint-Pierre. Often referred to as the Church of Saint Peter in English, it's one of the capital's oldest places of Christian worship but gets little attention from visitors. Erected in the mid-12th century, it's the former site of the Montmartre Abbey, tremendously powerful during the medieval period. Other important churches stood on the same site, as early as the 3rd century according to some historians. The presence of Roman-style columns in the nave seems to support this theory. This was also pilgrimage stop on the way to the enormous Saint-Denis Basilica north of Paris. A visit to the neighborhood wouldn't be complete without an ambling walk around some of its winding, ultra-photogenic streets, squares and quiet passageways. Roam around at an aimless, relaxed pace and keep your eye out for climbing ivy on quaint old houses, steeply wending paths and dramatic stairways studded with elegant lamps, quiet garden walls behind which you can peek lush blooms and a cat or two, and historic squares haunted by famous painters and musicians. Take a peek at the Musée de Montmartre and learn more about the area's centuries-long history and artistic legacy. Go see the Bateau Lavoir, where famous artists including Picasso and Matisse frequently worked. The neighborhood has so much to offer, and often the best experience of it comes from exploring it in a spontaneous way. See more about exploring Montmartre by foot in our full neighborhood guide. The recommendations at this page are also useful. What some visitors don't know is that Montmartre was only recently incorporated into Paris. Prior to 1860, the area was an independent village important for its religious, artistic and agricultural life. The traces of the area's agricultural past are notably evident in the Moulin de la Galette, a dramatic and well-preserved windmill that juts out on a side street, impossible to ignore. Now occupied by a French restaurant serving fare reputed to be quite solid, the windmill is famous for its appearance in numerous Impressionist and Expressionist paintings. Auguste Renoir depicted a lively ball at the Moulin, and a lesser-known painting from Dutch artist Vincent Van Gogh also immortalized it. Consider having lunch or dinner at the restaurant, first opened in 1812. If weather permits and there are seats available, sit in the idyllic, historic garden and enjoy the greenery. Speaking of agricultural history, another piece of the puzzle will come into place by heading over to the nearby Rue des Saules. Here, at the corner of Rue Saint-Vincent, see the last functioning vineyard in the storied neighborhood. It's locally referred to as the "Clos Montmartre" and is actually fairly recent: it was planted by the city in 1933 as a way to prevent excessive property development on the hill. While it does produce a few bottles, notably for the annual wine harvest celebration known as the Vendanges de Montmartre, the vines here are primary ornamental — and a reminder that the neighborhood was very recently a bucolic village. Set in a quieter area, away from the hustle and bustle of the Sacré Coeur and the crowded Place du Tertres, the Montmartre Cemetery beckons as a place of peace and poetry. Smaller than the Pere-Lachaise and Montparnasse Cemetery, it's nevertheless a lovely spot for a stroll. Wend through the 19th-century pathways and search for a few famous graves: luminaries including Alexandre Duman, French actress Jeanne Moreau, painter Francis Picabia, filmmaker Francois Truffaut, singer Dalida and many others have their final resting places here. The cemetery is also famously photogenic, full of interesting, decorative graves and bands of feral cats that you can spot sunning on tombs. Finally, what better way to conclude a day wandering around Montmartre than enjoying an evening at a local cabaret? While most tourists head back down the hill to Pigalle and the Moulin Rouge, why not consider something a bit more traditional and rough around the edges? The cabaret shows at the Au Lapin Agile are about as old-Montmartre as you can get. Frequented by Picasso, Maurice Utrillo and other early-20th-century artists who lived and worked in the area, the cabaret opened in 1860. While outfits such as the Lido and the Moulin Rouge focus mostly on slightly bawdy, theatrical dancing, shows at the Lapin Agile heavily feature traditional French songs and ballads. You can even listen to some of them here before reserving, if you're after a bit of inspiration. Reservations aren't required, but are recommended — especially during high tourist season (approximately April through October).